Decorate your home or cabin with this Team Realtree Bill Jordan Bucks Area Rug from Milliken, the leader in textile research and design. Available in 3 sizes. 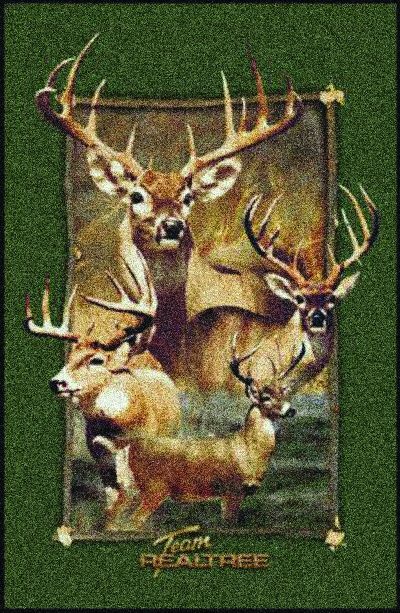 Decorate your home or cabin with a Team Realtree Bill Jordan Bucks area rug from the Camo Rugs Realtree Collection from Milliken, the leader in textile research and design. These plush indoor area rugs are made with 100% Invista Stainmaster nylon and are injected-dyed for rich and vibrant color clarity. Constructed with a woven action back and serged borders for a tailored look, Milliken area rugs come with a 5 year wear warranty. Vacuum regularly. Made in USA. Note that this product is built to order and will be shipped directly from the manufacturer within 1-2 weeks.